Terry McPhillips suggested Blackpool’s failed diamond formation could be banished to the history books. At Bradford City last Saturday the Seasiders reverted to the 4-2-3-1 system that proved so effective for the majority of the campaign. It paid dividends as McPhillips’ men routed Gary Bowyer’s rock-bottom Bantams 4-1. Pool had used the diamond formation in six of their previous seven outings, collecting only five points out of 21. McPhillips revealed that he had introduced that system for the goalless draw at Charlton Athletic last month in order to field two strikers. But it resulted in Blackpool becoming too narrow and relying on the full-backs for width, which certainly wasn’t the case at Bradford. “It’s fine margins,” McPhillips said, when asked why he decided to ditch the diamond. “We had a conversation with Chris Long and he told me he’s disappointed not to be on six or seven goals now. If he was, he knows he would have been starting. “He’s a great kid and that’s how close it is. In recent weeks we’ve gone with the two up top but we haven’t been clinical enough. We’ve had the chances. We’ve just not put it in the back of the net. One man to benefit from Pool’s changed approach was Nathan Delfouneso, who made his first start since the homecoming clash against Southend United. The 28-year-old was a constant threat down the right and bagged the assist for Chris Taylor’s goal. Delfouneso made a surging run into the box before putting the midfielder’s first Blackpool goal on a plate. McPhillips added: “Nathan scored a hat-trick against Bradford last year, so I fancied him. Pool’s return to winning ways coincided with the return of key players Marc Bola and Curtis Tilt. “It’s great to have Bola back and Tilty, it really is,” McPhillips added. “Ollie Turton is knocking on the door as well, so that will be a tough one when he comes back. “The goalkeeper (Christoffer Mafoumbi) was superb as well. “We obviously had more chances and didn’t hit the target, but we were certainly a lot more clinical. “That’s the difference with these fine margins. If Bradford scored their ghost penalty which never was, it’s 2-1 and game on. 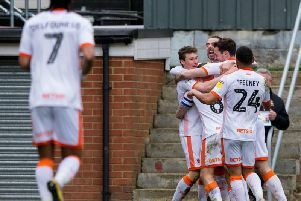 Eighth-placed Blackpool now find themselves four points outside the League One play-off zone after Doncaster Rovers reclaimed sixth spot with Tuesday's 4-1 home win over Bristol Rovers.